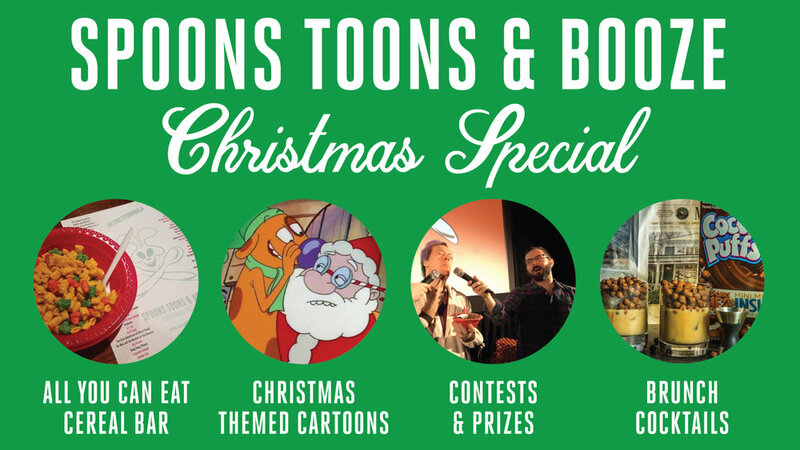 Your Favorite Saturday Morning Cartoons + Booze & Free Cereal + a Special Menu of Christmas Themed Episodes! – Over 100 cartoon series from the 1940’s through the early 2000’s and YOU get to choose what we watch! – Special menu of Christmas themed episodes including the rare “He-Man & She-Ra: A Christmas Special”, only aired once in the 80′s and then banished to VHS obscurity! – Special appearance by Santa Claus himself! Have your picture taken on Santa’s lap and send it to your parents. – Dress in your ugliest holiday sweater or coziest PJs! – Free all you can eat cereal bar filled with all the sugary, marshmallowy, fruity, chocolaty cereal you crave! Soy and regular milk available. – White Russian menu including “The Sonny”, a White Russian topped with Cocoa Puffs! – Cereal Shots! Drop a shot of Baileys or Kahlua in to booze up your cereal bowl! – Compete in contests to choose which cartoons we watch and win cartoon- and cereal-themed prizes!